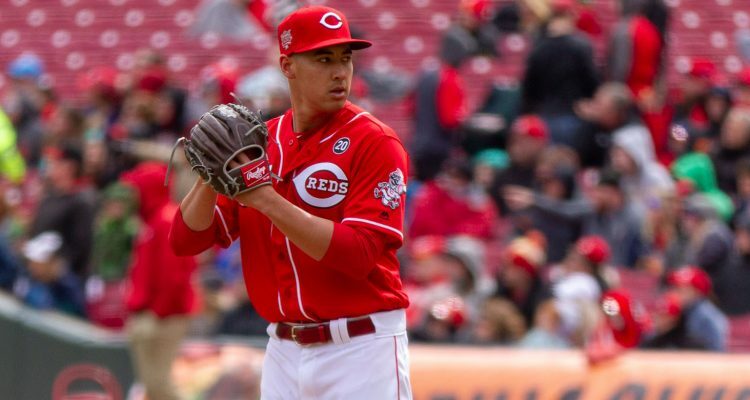 Robert Stephenson likely made the Reds’ Opening Day roster because he’s out of options. He’s sticking around based on merit. It’s early — he’s faced only 20 batters — but the 26-year-old looks like a different pitcher in 2019. His stuff looks as filthy as ever. In 5 1/3 innings, Stephenson has struck out seven and allowed only three hits and one earned run. Most notably, though, he hasn’t issued a walk. Control has long been a pain point for Stephenson, preventing him from becoming the No. 1 starter many envisioned. He held an 11.0% walk rate in the minor leagues, and that number only got worse in his first three years of major-league action (13.6%). The former first-round pick was so wild that it threatened his future with the Reds. Although he has swing-and-miss stuff, his inability to keep the ball over the plate made his peripherals (5.50 FIP, 5.33 xFIP) just as ugly as his ERA (5.47). Even in Stephenson’s best stretches, the walks were problematic. In his impressive 10-game run to end 2017, his xFIP (4.68) was over two runs higher than his ERA (2.50). Other factors played a role, but walks were the primary reason. He struck out 24.1% of batters in that span but also walked 13.1%. Stephenson consistently missed the plate high and to his arm side or left the ball in the heart of the zone. He seemingly didn’t know where the pitch was going in a lot of cases. Through 2018, only 48.7% of the fastballs he threw were in the strike zone. The league average in that span was 53.6%. A total of 273 pitchers threw at least 1,000 four-seamers in those three years. Stephenson’s Zone% ranked 254th. That ranking isn’t everything, as some successful pitchers fell below him on that list, including Corey Kluber, Blake Snell, Masahiro Tanaka, Tanner Roark, and Lance McCullers Jr. Those pitchers generally have good command or an elite strikeout rate to make up for so-so control. 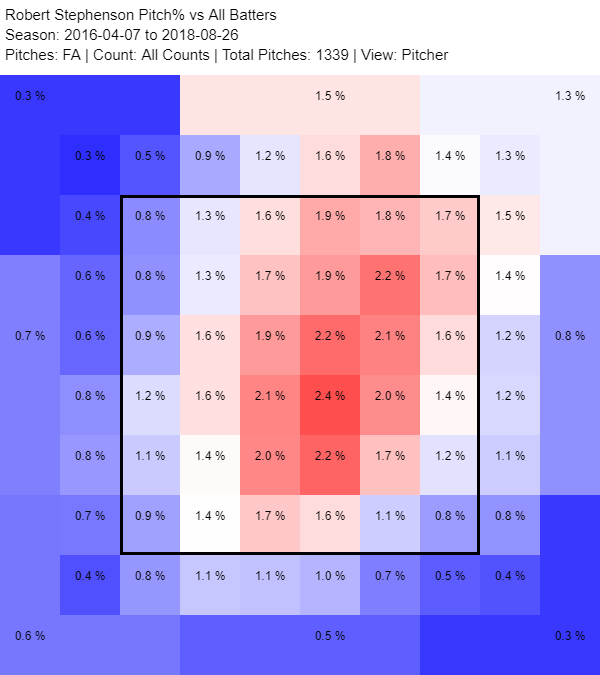 For a pitcher like Tanaka, who has a career walk rate just north of 4%, it tells you many of those fastballs out of the strike zone were probably intentional waste pitches. Not only did Stephenson’s poor fastball command cause his issues with walks, but it led to missing his spots in the zone, too. And that usually means hard contact. The numbers on his fastball when put into play were ugly. You may want to look away for this part. Between 2016 and ’18, Chris Young was the only pitcher with a worse xSLG or xwOBA on the four-seam fastball than Stephenson. Young and Anthony DeSclafani were the only pitchers to allow a higher slugging percentage. Nine pitchers allowed a higher batting average, and 23 allowed a higher average exit velocity. Six pitchers had a worse fastball pitch value, which is a cumulative stat. His fastball ranked that low despite throwing at least 87 fewer innings than every pitcher in front (behind?) him on the list aside from Young. Of his 23 career home runs allowed, 17 were on the four-seamer. It was simply a lousy pitch. 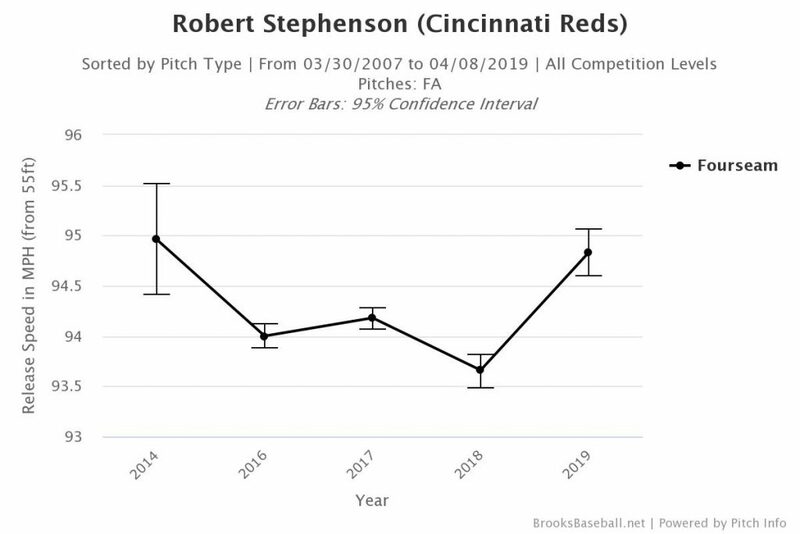 You’re excused if you thought Stephenson had no chance of making the Reds’ roster in 2018. His nasty off-speed pitches teased everyone, but they were almost rendered moot because of his fastball command. Despite a late start in spring training, he came in throwing strikes. He painted the corners with his fastball better than before. That has carried over into the regular season so far. Stephenson has thrown 20 of his 30 fastballs in the strike zone. Yes, it’s a small sample size, but Stephenson looks undeniably different. He credits a new grip on his fastball for the improved command over the pitch. Stephenson can also credit his early success to a slider that has become his best pitch. As he mentioned in Bobby Nightengale’s story linked above, he used to throw a curveball but eventually scrapped it because he couldn’t control it. The slider is easier for him to control and fools hitters because it looks more like a fastball. The slider is so good, in fact, that he now “pitches backward,” meaning he uses it as his primary pitch instead of the fastball. This trend started last year and has continued into 2019. McCullers brought this idea to the forefront when he threw nothing but curveballs in one outing during the World Series in 2017. Other pitches have embraced it, too. It played a huge role in Patrick Corbin’s breakout last season. This not only helps Stephenson feature his best pitch but minimize how much he has to throw the fastball. He can still use the heater to get ahead in the count and keep hitters honest — he just doesn’t need to use it as heavily. Notice a difference? To the naked eye, the pitch appears to have a sharper bite this year — that “fall off the table” action, if you will. That’s because it’s getting more movement, both vertical and horizontal. Stephenson not only changed the grip on his fastball but on his slider. While his fastball spin has stayed steady, the slider is getting significantly more rotation and, as a result, movement. A slider’s spin rate and movement can vary and still be a successful pitch because there’s no universal way to throw it. The shape of a slider varies tremendously between pitchers. Compare Max Scherzer to German Marquez. Both players throw highly effective sliders, but they look different. Marquez throws more of a sweeping slider, while Scherzer throws one that drops more than it sweeps. “Some spin (transverse spin) makes the ball move, but a different type of spin (gyrospin) doesn’t. Gyrospin is the kind of spin a quarterback uses when throwing a spiral, or a bullet has when fired from a gun. The goal with gyrospin is to prevent vertical or horizontal movement. Essentially, a high spin efficiency can provide that extra “life” on a pitch. A high spin rate with a low efficiency will have more gyrospin and will move straight with less movement; in other words, that pitch becomes more hittable. Sliders usually have a lot of side spin to generate horizontal movement. Kyle Crick had the highest slider spin rate (3,196 rpm) in baseball last year and ranked second in horizontal movement. In other words, the pitch had a high spin efficiency. Garrett Richards was second (2,897 rpm), but his slider ranked 132nd in horizontal movement — a low spin efficiency. Both pitches are still effective, and Richards even had a higher swinging-strike rate, but you can tell the difference in movement between the two pitchers’ sliders. Some pitchers can still get a lot of whiffs on sliders with a low spin rate because of a high spin efficiency. Because of the low overall spin rate, the movement isn’t as impressive, but the results are the same. But high spin rate certainly doesn’t hurt. The average slider spin rate in 2018 was 2,398 rpm. Pitches above that mark had a 14.4% swinging-strike rate, while pitches below were at 11.3%. On pitches swung at, sliders with above average spin got a 30.0% whiff rate; those with below average spin were at 23.8%. Back to Stephenson. In 2017 and ’18, his slider registered a 23.5% SwStr%, which ranked 29th among 280 pitchers who threw it at least 300 times. He did that despite ranking 313th (2017) and 287th (2018) in horizontal movement among right-handed pitchers who threw a minimum of 50 sliders. His vertical movement wasn’t much better at 193rd and 188th. It’s no coincidence that the pitch is getting more whiffs. Stephenson is getting a higher spin rate and efficiency, which is translating into more movement. His slider is still in the middle of the pack in terms of movement, but it’s yielding positive results. Batters have swung and missed at the pitch 31.6% of the time he’s thrown it so far. That’s up from 25.0% in 2017 and 18.7% in 2018. Only six pitchers who’ve thrown at least 25 sliders this season have a higher SwStr%. The Reds’ increased use of technology could be playing a huge role in Stephenson’s better slider. The team, like all others in baseball, has started using cameras from Rapsodo and Driveline to break down a pitcher’s spin rate and efficiency, velocity, movement, release point, and extension. By using this technology, a pitcher can figure out how to improve and find their ideal grips and mechanics. Assistant pitching coach Caleb Cotham worked for Driveline after his retirement from baseball and will play a critical role in communicating this data to pitchers. Sonny Gray discussed this in an excellent article by The Athletic’s Eno Sarris. Early on, the work of new pitching coach Derek Johnson and Cotham seems to be paying off with Stephenson. Of course, this all comes with the small sample size caveat. However, Stephenson has made easily identifiable and verifiable changes that have led to his initial success in 2019. Maybe he’ll regress to the Stephenson of years past. But maybe — just maybe — the former first-round pick is finally putting it together with the help of new pitching coaches and technology. The question is does he stay in the bullpen in the future or does he get a another shot as a starter, if he continues to play well? Stephenson will pitch from the bullpen this season, pending an opportunity opening in the starting rotation. Hopefully DB and DJ will continue with a commitment to extending Stephenson and keeping him stretched out while he works out of the bullpen. Hopefully that same approach will also be utilized for Garrett, Lorenson and Iggy. I don’t have much patience with Duke at this point, but I hope Hughes can regain his ground ball dominance and Hernandez can provide some utility out of the bullpen. Change of coaches almost as important than the proverbial change of scenery. Glad for him. Will be a starter sooner or later. Still behind Mahle on pecking order but ahead of Reed and Romano. It almost be worth Johnson’s entire contract if all he did was get Stephenson pointed in the right direction via a new fastball grip. I agree with the comment below that he will need decent command of the third pitch to be a starter, but right now out of the pen he only needs the two. Let him have a taste of success with what he’s doing now, build more trust with the coaches, then add on a layer of complexity later. I think he’s already earned a promotion to be used in tighter situations and more often. He looks like a much more confident pitcher and his stuff is nasty as ever. Maybe SP is in his future. I’d rather see Stephenson in a tight spot than Hernandez right now. Maybe over Hughes as well. Pleasantly surprised with 2019 BobSteve. WOuld recommend putting him into tougher situations out of the pen and looking for success there before moving him to the rotation. A situation that may have called for Hughes or Hernandez last year can call for him now. Would kill 2 birds with one stone. It could be as simple as BobSteve pitching less is making him look better. Probably needs a third pitch to think about starting. When he was in Dayton way back when (back when his curveball still worked), he had an above average changeup. I’d like to see Derek Johnson work that back in later in the year once BobSteve has established some consistency, and depending on how that goes would determine if he gets another look at starting. MLB history is littered with guys who didn’t figure it out until their mid to late 20’s, that’s why you never give up on arm talent, especially arm talent that has elite potential. BobSteve’s pitches have always looked nasty, he just had no idea where they were going half the time. He could still use the curve occasionally, as an unexpected pitch. A lot of very good pitchers have won and been successful with just two pitches. I think it is a mistake to use a third pitch you can’t control and may end up being a big meatball for somebody to hit out of the park. Tremendous article. Really well done. If you ever seek paying baseball writing jobs, send this as your writing sample. I was going to say the same thing. Great analysis and is on par with anything you can read at Fangraphs. Thank you both! I really appreciate it. Glad you enjoyed! Great job Matt. Very interesting article. The confidence seems to be flowing from Stephenson now. Stephenson will be important for the 2020 rotation. I believe he’ll slide in nicely at the #3 or #4 rotation spot. Johnson and Cotham have seemed to have gotten Stephenson to finally turn a corner. Using 2019 as a stepping stone for 2020 is not a bad idea. Get his confidence back up, get him more comfortable with what he is throwing and how he is throwing the ball and then unleash him on the NL. I am very excited to see how Stephenson progress through the first half of this season. 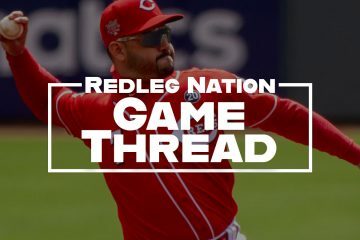 I am hopeful that the Reds will create an opening in the rotation for Stephenson and Mahle by the end of July. Give them August and September in the rotation to get them ready for 2020. An extension for Castillo, and marked improvement from Stephenson and Mahle would make 2019 a success no matter what the end record ends up being. Stephenson and Mahle would be 2 building blocks to add to Castillo and Gray. If those things happen, the last rotation piece comes down to deciding between Alex Wood and Anthony DeSclafani. There would be no need to rush up Santillan or Vlad Gutierrez in 2020. Let them work on their command a little more at AAA. Vlad Gut will be in AAA all of 2019 to work on his command (barring being called up because of injury or performance issues), so he should figure into the rotation competition next year. Santillan I could see wanting to wait until mid 2020 at the earliest. They’ve been very deliberate and steady about his development and promotion (similar to the way the Rays bring their pitchers along) and it has really worked well with Santillan improving in a different aspect each year while maintaining the previous improvements. This year it seems to be adding that low 80’s curveball to change speeds, last year it was a focus on control, the year before that it was making the changeup more consistent. Don’t rush Santillan, stay the course. The Reds OF defense surely isn’t anything to write home about. Need OF defense? Who you gonna call? Defense busters. The STL Cardinals Marcell Ozuna. I’m still laughing. I would love to see this in a game with the Cards in Mexico this weekend. I’ll be laughing for the afternoon on that one, too. Thanks, WV. Priceless. That is worse than Canseco-off-the-head. The guys in the Dodgers pen were laughing their tails off. Ozuna could stand pushing away from the buffet for a couple of months. As I recall, Stephenson was pitching well in AAA last year, and finally got a call up, and then promptly strained his shoulder. 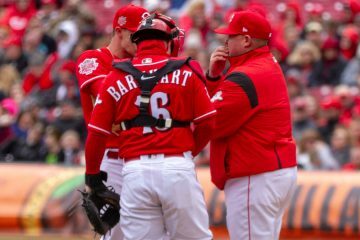 He looked poor in his few outings with the Reds last summer, then was shut down. We were all VERY down on him. I am glad he may have turned things around. I think one of the big separators from AAA to the Majors in pitching, is command of the strike zone. You can have great stuff and average command, and win in AAA, but the hitting talent is much higher in the Majors, and guys will wait out pitchers with poor command of the zone, and tee off on the fastball when they are expecting it. A good grip to control the ball is something important but subtle to the fans, who really can’t tell what the pitcher is doing. It is largely the effect of control, which then leads to more confidence in the pitcher, instead of constantly doubting where his pitches are actually going to go. And having command also means he will be less likely to overthrow the ball, and not hurt himself as a consequence. When “we” (the fans) watch the game, missing the zone and having poor command is all we see. Really informative and scholarly article Matt. Would love to see the “26’ers” become a core nucleus of this pitching staff with Gray and Iglesias. Thank you! I have high hopes for that group as well. We’re already seeing the impact Johnson and Cotham have had. I’ll piggyback on some thoughts expressed above. If Stephenson continues to pitch lights-out as a two-pitch reliever, will that mean the lack of a third effective pitch will preclude him from being an effective starter? He’s thrown a fairly effective changeup in the past. I’m curious to see if he’ll start working it in a little more as the season moves along. For now, I think he’ll stay in the bullpen for probably the whole season unless there’s an immediate need in the rotation. And even then, the team has several other options to fill in. Maybe the Reds will revisit Stephenson as a starter in the offseason when Roark and Wood leave. But they may also just leave him in the bullpen like they did with Amir Garrett and Michael Lorenzen. Should be interesting to see how it plays out. I think there’s a fairly high probability that Roark and Wood will be traded before the trade deadline, leaving an opening in the starting rotation for Stephenson to strut his stuff for 2 months. That would provide a good audition for the 2020 starting rotation without simply relying on spring training results to make that decision. I agree that the changeup could be a very effective weapon as a starter if Stephenson continues to demonstrate fastball control. If he is truly going to pitch backward (I.e. feature the slider more than 40% of the time) then he doesn’t need a change up. He could learn a splitter (easy to learn, hard to master) or a 2-seamer (easier) to keep that LH hitter from waiting on an elevated slider. You’d start both of those pitches middle of the plate and allow them to dive, and if he’s guessing 2 seamer/splitter and gets the heat then it’s a whiff or a pop up. If I recall Roger Clemens largely abandoned his change for a splitter the last 5-7 years – a decent comp for Bob Steve relative to velocity and bite. RH pitchers, if they can control their hard breaking stuff enough can get by without a masterful changeup. The key is to keep the LH slugger off guard with something (else) sinking. Wasn’t he working with a splitter at times in the past couple of years? So many guys getting auditions. Maybe I’m confusing him with somebody else. Stephenson’s “change” is a split. He’s been throwing it for a few years now. Trying to visualize a “reverse ‘C’ grip” if anyone has an image they can please share? I may be wrong, but typically, when you grip the ball, your index finger is closest to your thumb, and you have a tight grip. Closing that distance between thumb and index finger with your grip and you get the classic grip for a “circle change”, how a lot of pitchers grip the ball to throw a change-up, with the same arm speed. I think a reverse “C” puts the index finger in the grip farther from the thumb, and actually your pinky finger closer to your thumb, in terms of a grip. Thus a reverse “C” grip has the index finger farther from your thumb and maybe your fingers on top of the baseball, with your thumb lower and close to your pinky, compared to the normal “C” grip, where your index finger is closer to your thumb while gripping the baseball. Thanks David. Sounds like a reasonable guess to me. The big difference between the 2018 and 2019 videos of Stephenson is that he is finishing the pitch much more this year thsn last year. His 2018 pitch looks like a warmup toss, whereas he extends much further through the follow-through in 2019. He looks TONS better and more confident now. Kudos to the new coaches, but kudos to Stephenson for taking the advice to heart and implementing it. Talent always was there.Reds could have let him go but the reality is I don’t think they really believed they gave him a chance or maybe were afraid he would finally get it some where else.Regardless he should be given more high leverage situations and be ready to start if a guy goes down.Great arm and maybe the rest has finally arrived. C and reverse C has to do with the position of ball in hand…turning the ball on its x axis 90° thus changing Which part of the seams your index and middle finger are gripping. A c grip 4seamer from a righty has the horseshoe of the seam forming a C facing the pitcher. A reverse C grip has the horseshoe forming a reverse C facing the pitcher. The only I would have a problem with is “it tells you many of those fastballs out of the strike zone were probably intentional waste pitches.” Trying to tell what a pitcher’s intentions were off numbers? Especially since there were successful pitchers higher and lower than him on this stat? Basic rule of statistics. Numbers are numbers. They may tell “what’s going on”. They don’t tell “why”. There’s more needed in analysis for that. For, I believe no pitcher wastes pitches. They may set up the next pitch (Glavine was notorious for that, outside, outsite, outside over and over again, then punch it inside). If the location they are gunning for is bottom right corner, they may just be missing it actually (I have heard that AL umps have a tendency of having a higher K zone for whatever reason; and you did mention all AL pitchers in that context). Or, the pitchers may simply have missed their target. But, waste a pitch? I can’t believe that. I’ve never entirely understood wasting a pitch, but it’s very rare to see an unambiguous strike when the count is 0-2. My take is that they’re throwing something that the batter could do very little with, and hope that he swings at it. So, not necessarily intended to be wasted, but usually is, anyway.